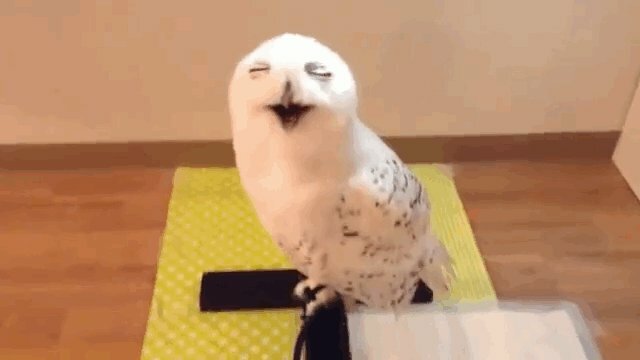 With eyes asquint and mouth curved open wide, this snowy owl seems to be experiencing a state of bliss often unrealized outside stoner comedies. The bird's cute, no doubt (even Gawker thinks so), and YouTube agrees - user Adam Poley's short video has garnered nearly 800,000 views as of this writing. But is this bird as totally excellent as he or she seems? Well, not quite. Kevin McGowan, a bird behavior expert at the Cornell Laboratory of Ornithology, tells The Dodo that the bird appears relaxed, but what comes off as a smile or laugh is actually panting. "It's a calm, hot owl in a brightly-lit bird hospital," he says. Given that there are multiple owls in the clip, the video was presumably taken at a bird hospital or sanctuary. It's unlikely it was shot in a home - owls, despite their Harry Potter charms, are illegal to own privately in the U.S.; the carnivorous and taloned birds, moreover, do not make good pets. The Dodo has reached out to Poley for comment. 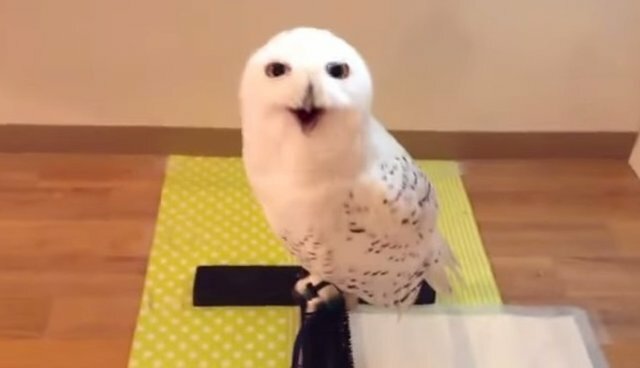 Instead of panting, tongues out, in the way dogs do, snowy owls perform what's called "gular fluttering." The owl's neck muscles undulate, sending hot air up and out the bird's mouth. That's not the only way birds beat the heat: Other avian species stay hydrated, stick to the shade or rely on large bills to cool down, too. McGowan describes the snowy owls as if they were covered in an incredibly warm down sleeping bag. "They spend the winter at the top of the world," McGowan says - the thermostat in a rehabilitation clinic might be set a little cozier than the snowy owls would prefer. Even though birds aren't capable of smiling (or Ron Swanson-like laughter), that doesn't mean they are precluded from feeling emotion. Evidence is spotty, but there are a few reports, such as a 2010 study of ravens in the journal PLOS ONE, that indicate birds can feel empathy after a flock member dies.